Affordable gifts and cards for all occasions. Original, personalised designs handmade especially for you in the U.K. Sold exclusively on NOTHS & ETSY. Feel free to contact me for bespoke designs customised to your requirements. I am currently experimenting with some new products to use initially with my 'I should be..' slogan. (N.B. 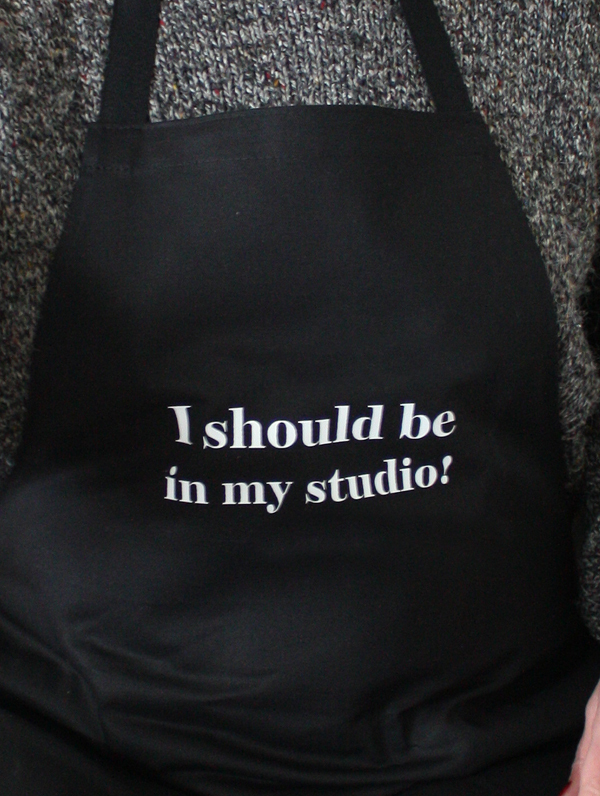 The 'should be' apron is unsuitable for anyone who actually enjoys cooking and cleaning).This is the part that takes me AGES as I need to be really sure I can come up with a really good quality product (and I am quite fussy). I have sourced some aprons/ bags etc. and samples have arrived. I have also decided how to apply text to the surfaces - above is test no. 1 which has just had it's first wash (of many). Now comes the bit which could take a while. Firstly I have to do a fair few more tests to make sure I can get the text to a) look good when first applied and b) stay looking good after lots and lots of washes. Then I have to decide what labels/ wash instructions, how to package, work out postal costs and time spent personalising and printing. I then have to check and double check all my sums to make sure that it is a viable product to sell after costs, commission, fees etc. I'm still at the first stage - checking that I can consistently produce a really high quality product and getting the products tested - so some of my family are likely to get a sample once I've done some more experiments. It will be accompanied with strict instructions to wash it every time they put a load on and then report back to me in a few months. (I think my son will be getting 'I should be in the pub!' and my daughter 'I should be shoe shopping!'). All products copyright Kate Smith unless stated otherwise. Powered by Blogger.